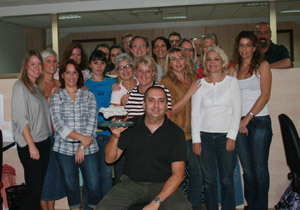 WINNING TEAM: EWN Editor Alfredo Bloy (foreground) proudly displays the award, surrounded by colleagues at the company’s Benalmadena head office. Organised by CADE Marbella, in collaboration with Marbella Town Hall, Unicaja International, Andalucia.Com and the Chamber of Commerce in Málaga, the annual awards event is designed to ‘recognise and promote excellence, good practice and innovation in the Andalusia business community’. As the award was being announced last Thursday – one of seven as part of the prestigious Costa del Sol Business Awards – the Costa del Sol edition of the newspaper was hitting the streets with a record-breaking 104-page issue. EWN is proud to announce that this week, we are even bigger, with 448 pages across our six editions in Costa del Sol, Costa Blanca North and South, Costa Almeria, Axarquia and Mallorca. Among strategic targets of the Junta de Andalucia is that foreign residents further develop their business activities, creating more as well as larger and stronger companies that are additionally more innovative, better connected and integrated in the region. 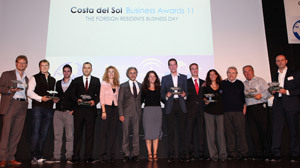 WINNING SMILES: Winners and officials at the 2011 Costa del Sol Business Awards presentation ceremony. EWN representatives were unable to attend the event due to unforeseen last-minute circumstances. As publishers of the fastest-growing foreign media group in Spain, we are proud to share the momentous occasion of winning the prestigious Company of the Year award and a record-breaking 448 pages this week across our six editions with our loyal readers and customers. The sheer size and scope of EWN simply cannot be matched. Our growth and success – with the Company of the Year 2011 title the most recent of several previously-won awards – is our testimonial. As with all our advertisers, we are fighting this economic crisis together, and together we will prevail. In the last month, to continue EWN’s incredible growth we have had to increase the size of the EWN staff by employing one extra person every three days, including weekends, something that further adds value to the local community we are proud to be part of. Over the last 16 years, much has happened in the global media world. EWN can now proudly and justifiably hold its head high and above all its competitors, not only in Spain but also throughout Europe. THE Company of the Year must demonstrate excellence within its industry or activity by showing the added value which is making a difference compared to its competitors. It must show overall product and services market potential, plus success established by company growth, viability, strategic innovation and leadership in its field. The company must consider the interests of society taking responsibility for the impact of its activities on customers, suppliers, employees, communities and the environment. This obligation is seen to extend beyond the statutory obligation to comply with legislation, taking voluntary further steps to improve the quality of life for employees and their families as well as for the local community and society at large. This award by the Junta de Andalucia is proof of the excellence EWN has shown over the past years and we want to send our heartfelt congratulations. Our company has witnessed the constant growth by this publishing company with which we have a strong relationship. Manuel Garcia, Director of Artes Graficas del Mediterraneo of Valencia, printers of EWN with 134,000copies per week. 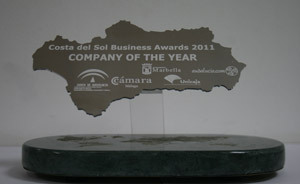 Congratulations to all the award winners and particularly Euro Weekly News for winning the Company of the Year at the Costa del Sol Business Awards. I have met many of the multi-national EWN team and I am always struck by their professionalism, passion and love for the Costa del Sol. A great result for a great team! Steve Jones, British Consul for Andalucia based in Malaga. Congratulations. I believe this prize is fully deserved as a result of hard work and professionalism. Manuel Alvarez Vazquez, Director Banco Popular, Benalmadena. Bankers to EWN Publishing Group.